We have noticed a lot of flag flying around Switzerland. I think they are generally a lot more keen on this sort of thing then we are in Australia, but it is also due to the fact that 1 August is Swiss National Day and everyone is feeling especially patriotic. We went with Guido to Zurich for the day, starting out on foot to Kyburg, a castle about an hour from here, then by bus and train. It was sunny and quite hot. Swimming and sunbaking was pretty popular. We all had a swim in the lake and then a ferry ride to the centre of town. 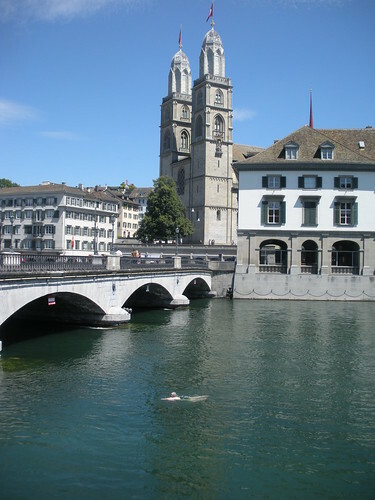 On Guido’s advice we decided to leap into the Limmat River which flows out of Lake Zurich with quite a current, and float downstream a short way. This was good fun though it could easily have been a longer trip as it was harder than it looked to stop and climb out! Then on the train to Uetliberg where there is a lookout and tower overlooking Zurich and giving a 360 degree view of the surrounding countryside. The Swiss celebrate their national day with fireworks and bonfires. We went to watch the lighting of a huge bonfire nearby followed by the municipal fireworks display. This entry was posted on 1 August 2010 at 9:52 pm and is filed under Switzerland. You can follow any responses to this entry through the RSS 2.0 feed. You can leave a response, or trackback from your own site. Rosalie you still manage a swim in a landlocked country!